“Speech is my hammer/ bang the world and it's shaped/ now let it fall” (Mos Def). Growing up, I remember hearing young people use terms like, “Word is Bond.” So much so, I didn’t always grasp the depth of this phrase: what people were really saying. Over the years, I started to realize that when using this phrase, most people were referring to the fact that 1) a person’s word is equivalent to a binding agreement/statement or 2) what had been stated was, in fact, truth. Either way, it was clear that word was bond: that word was enough. As I’ve gotten older — and hopefully wiser — I have begun to realize the sanctity of spoken words. When I think about the function of speech in oral societies, where speech itself reigns supreme, I reflect on how important speech is to African people. It is interesting how, far from the continent, individuals of African descent are still holding on to the value systems — derived from Africa — which privilege speech and the spoken word. 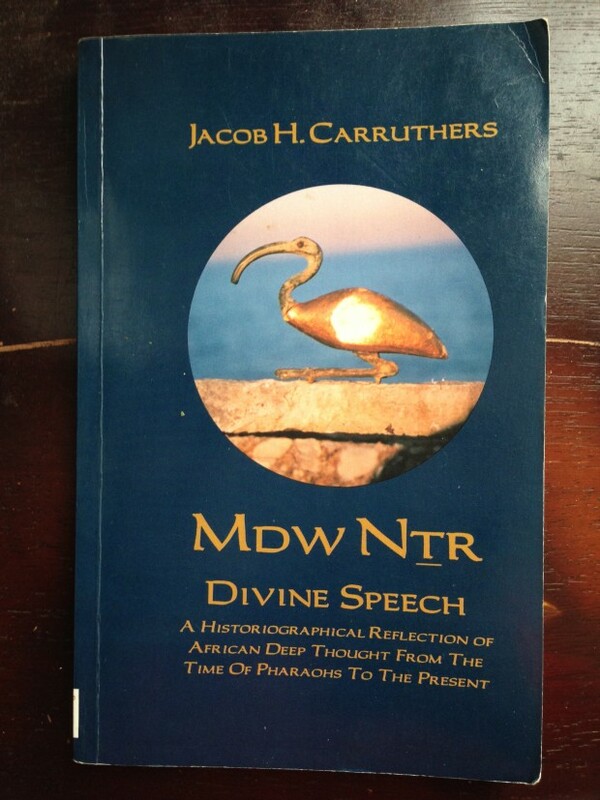 In Mdw Ntr, Divine Speech: A Historiographical Reflection of African Deep Thought From the Time of the Pharaohs to the Present (1995), Dr. Jacob Carruthers gives an impressively thorough chronology of the role that speech plays in the cultural foundations of Ancient Kemet, the Western Sudan (West and Central Africa) and the Southern regions of the continent. 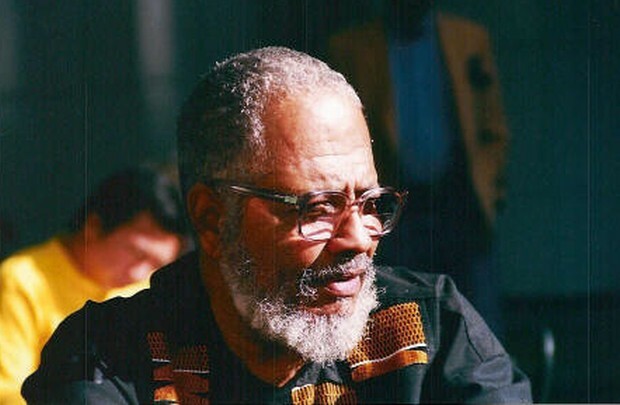 With the complete depth of a sophisticated scholar (please note that the homage paid is simply due, ase) Carruthers provides a detailed analysis of the African experience as it relates to speech, more importantly divine speech (as it has informed the realties of Africans since the beginning). What makes the text even more interesting (and subsequently even more valuable) is the depth with which Carruthers addresses each aspect of speech (as it is practiced and utilized among African people across the continent). Throughout the text, Carruthers exhausts various methods of approaching this sacred element of African cultural practice and tradition. He writes: “In Africa, speech cannot be reduced to a mere medium of exchange. Speech may be considered the servant of thought, but it is an essential servant” (96). Thus, speech is deemed a process of thought, an end result of thoughtful analysis. Carruthers notes that among Ancient Kemites mdw ntr or “Medew Netcher” referred to “God/Divine Speech.” He compares the pictorial representation of mdw (speech) — which means staff or cane (as in old-age) — to the concept of Hu, which refers to authoritative utterance or articulate command (45). Consequently, mdw (in the sense of mdw nfr or beautiful speech which may, in fact, be mastered* by humanity) is more about profound thought coupled with the accurate presentation of that thought than simply about eloquence in one’s verbal presentation alone. “For the Kemites, speech is really the operational base of knowledge, i.e. it is through speech that we know... In other words, one thinks in speech. Even when one only “thinks” about thinking, one thinks through (silent) speech. Thus, one may say the ‘word’ truly creates for human consciousness. At least it authorizes and verifies that which is created... In that sense, speech and creation are inseparable, and all of what we call theology, philosophy, science and even technology are aspects of divine speech” (44). [Italics mine]. Simply put, Divine Speech exists as the manifestation of refined thought and action. With the grace of a true scribe, Carruthers delves into the core of the African lived experience, as it relates to creation, articulation and mastery: all of which are divinely inspired. More importantly, Carruthers brings to light the truly African elements of the oral tradition, which are necessarily immaculate in their nature. Mdw Ntr is compelling and successful. It is a noteworthy text that requires conceptual freshness and an appreciation for precise scholarship. Although I cannot be too sure about the origins of the famed phrase “word is bond,” nor the cultural ramifications of the saying, I am certain that it is an example of how inadvertently Africa has been extended. * Please note that although mdw ntr is attainable, it is not necessarily mastered by every human being simply because divine speech implies communion with and adherence to divine order and balance. Moreover, humanity is plagued with aspects of “bad speech” (as opposed to mdw nfr “good/beautiful” speech) reflected in the words and deeds of evildoers and/or those who are ignorant of divine speech. Carruthers writes: “Good Speech, however, was the domain of humanity. Individuals could chose between Good Speech and not-good speech as in mdw dw (evil speech)... and tftf (idle chatter). Only Medew Nefer [mdw nfr] was in accord with Medew Netcher [mdw ntr]. In fact, it is through the consistent practice of Medew Nefer that human beings finally attained Medew Netcher, Divine Speech” (40).